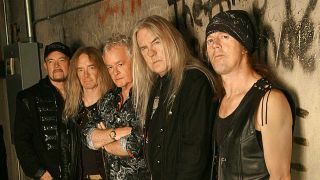 Saxon frontman Biff Byford says the band are planning on celebrating their 40th anniversary in 2019. They’ve just kicked off the UK and European leg of their Thunderbolt tour and are currently in Norway. And the vocalist says that once this year’s shows wrap up, they’ll turn their attention to 2019 to mark the career milestone. Byford tells Moshpit Passion: “We’re touring until December – but we’ve got something planned next year for our 40th anniversary. Last week, Saxon released a video for their Thunderbolt track Predator which features a guest appearance from Amon Amarth frontman Johan Hegg. Earlier this month, Saxon also released a tour edition of Thunderbolt. Along with all 11 album tracks, the special edition features the Raw Version of Nosferatu, along with two live cuts: Thunderbolt, recorded in Frankfurt in March, and Nosferatu (The Vampire’s Waltz), which was captured during Saxon’s performance in Los Angeles in April.